Pet turtles need a lifetime of special care and attention. They need a peaceful environment that has the correct water temperature, lighting and water filtration system. Separate land and water areas within the tank are required, along with an area that has a sun lamp for the turtle to warm himself. Turtles need a lot of room to grow. Beginner tanks should be about 40 gallons and increase in size as the turtle grows. Some turtles adapt to a new tank within hours or days, while others are more sensitive and require patience by the pet owner to adapt. Changes in a turtle's habitat can cause stress and the immune system can be affected. 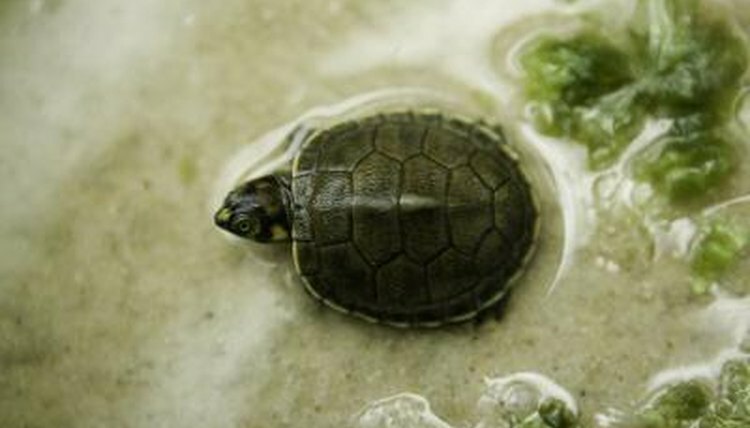 Sudden and extreme water temperature changes can cause a pet turtle to feel uncomfortable and delay the process of adapting to his environment. The exact water temperature requirements depend on the breed of turtle. Check water temperature regularly to make sure it's consistently within the right range for the species. Submersible aquarium heaters will help maintain a steady temperature. Aquatic and semi-aquatic turtles require UVB and UVA light every day, usually for 12 to 14 hours a day, which is similar to the light cycle in their natural environment. UVB light should be the main lighting for the tank; it simulates a natural environment and contributes to vitamin D3 production. UVA light is used as basking light and is usually located in a specific spot within the tank. UVA affects appetite, encouraging activity levels and breeding. Providing pet turtles with full spectrum light will assist them in feeling comfortable and adapting to their tank. Your turtle's environment should be clean, not just for the adjustment period but all the time. Turtles release a lot of waste into the water. A filtration system will keep water clean. In addition, perform water changes at least every two weeks. Remove any uneaten food or particles from the tank with a net to prevent the food from spoiling and contaminating the water. Providing a healthy and clean environment will assist the turtle in his adjustment.